This is a time to ask questions. Not small questions but big, fundamental questions. What role did Design play in contributing to our current global crisis? And what role should/will Designers play in leading us out of this mess? The gloves have come off over the last few months with a raft of posts by influential design thinkers questioning the impact of Innovation and Design Thinking, two of the most fashionable elements of contemporary design practice, on business practices. We have been operating under the assumption that the primary challenge is to convince businesses to focus on fulfilling user needs with higher quality products, with more meaningful experiences? But what if the 'users' themselves are the problem? I have already written about the drive for more direct social engagement among designers, particularly young designers, as reflected in programs like TU/e and design firms like Project H. By embracing a more active form of engagement and influence, these designers are asking perhaps the most fundamental question of all: do we need to shift the conventional notion of User-Centered Design (UCD) and rethink the very foundation of contemporary design practice?This may sound like blasphemy, particularly at times like these. With people struggling in so many areas of society it would seem to be more important than ever to focus our efforts as designers on addressing specific, observed human needs. And I am not advocating that we abandon the methods of UCD wholesale. But is UCD sufficient? Is it the right compass to guide us toward the larger scale social changes that we need? Over and over, I have seen how a UCD process will tend to emphasize certain benefits of an experience like 'convenience' over other, more meaningful sources of social value. In the hypercompetitive global marketplace, our clients often encourage us to identify unmet needs and desires that can help them differentiate their products and accelerate the familiar cycle of consumption and disposal. Yet, these desires are not purely manufactured. They often connect with deeply-felt needs for self-expression and personal fulfillment on the parts of our 'users'. This is particularly true as more and more devices become connected. We have been operating under the assumption that the primary challenge is to convince businesses to focus on fulfilling user needs with higher quality products, with more meaningful experiences. But what if the 'users' themselves are the problem? What if users represent not a coherent set of needs but a messy mix of desires and influences? What, ultimately, is the role of the designer in sorting through these desires to determine which should drive our design decisions? And what frameworks, other than intuition, should we use to make these judgments? Our design decisions are just one influence among many, not categorically different, and often not the most effective in motivating the user to achieve their desired aims. There are no easy answers to these questions. They call our attention to the increasingly difficult task of maintaining the myth of the neutral designer whose role can be purely defined as one of 'supporting' existing needs. This shift in perspective is being driven, in part, by the popularization of Behavioral Economics through books like Nudge and Predictably Irrational]. These books are troubling to read. They remind us that often the most influential aspects of an experience are overlooked in a traditional UCD process, such as the order of the options in a web form, or whether a cup of coffee is warm or cold. They highlight a set of principles that do not jibe with our design education, with the 'Universal Principles of Design'. For example, there are principles from the social sciences, like Social Proof, exemplified by the smiley face on a utility bill which has been shown in studies to motivate people to reduce energy consumption by 20%. This does not come out of the traditional design playbook. 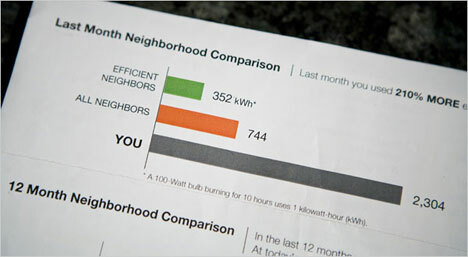 New style of utility bill that incorporates social comparison as a form of influence. What we are beginning to appreciate is the degree to which user behavior is ALWAYS subject to influence. We should not assume that our role is to somehow remove those influences so that the user can act in a free and unconstrained manner to achieve their own needs, as that is impossible. The user is not a self-contained actor in the system, but one who is largely and continually open to influences, the most important of which he/she is generally not conscious of. Our design decisions are just one influence among many, not categorically different, and often not the most effective in motivating the user to achieve their desired aims. As the notion of the 'end user' becomes more and more fuzzy, the center shifts. We are faced with tough decisions regarding the different forms of influence that we choose to embrace in our work. As we look for a compass relative to these decisions, perhaps the focus will shift from the individual to the community, from personal needs to social exchanges. As Jess McMullin correctly observes: "Groups and individuals are the yin and yang of influence. To convince a group often means convincing individuals. And convincing individuals often means convincing a group. Knowing who to focus on, and in what setting is the key question we have to answer when we want to affect a decision." If we want to impact these ecosystems on a large scale we must increasingly design for social systems, not individual needs. This is particularly true in areas like energy and healthcare that are of increasing interest to the design community (particularly to designers who want to have a meaningful social impact). If we want to impact these ecosystems on a large scale we must increasingly design for social systems, not individual needs, for it is within cooperative systems that personal fulfillment has the best chance of intersecting with broader social values. And personal decision-making can achieve larger 'scale effects.' Folks like John Thackara have been calling our attention to this for some time: "It's about groups, communities, neighborhoods in which you have the capacity for a community to investigate and invest in solutions rather than individuals." Community landsharing services in the U.K. But engaging with communities is fundamentally different. We are not merely substituting one center (the user) for another (the group). With communities, the means of engagement and influence exist across the participants not within a single person. Value is created and shared dynamically through cooperative activities that are not often apparent from the outside. They emerge from within. As Dan Arielly explains Predictably Irrational, market exchanges are fundamentally different than social exchanges: "So we live in two worlds: one characterized by social exchanges and the other characterized by market exchanges. And we apply different norms to these two kinds of relationships". And applying the rules of one to the other usually backfires. As much as we can look at the external symbols of communities (such as status and reputation) we cannot appreciate the nuance of social behavior without participating. Certainly not to the degree that is needed to support effective design solutions. We need to prototype from within. To participate. What forms of design practice are emerging in this new context? Assuming the role of the designer is not neutral, how do you engage a community, open up new possibilities and influence behavior without imposing an external point of view? Participatory Design has been an accepted practice for some time now. When applied to communities, it implies a change in roles between the designer and the user, as Ezio Manzini observes: "Social innovation in the age of networks is a process of change where new ideas are generated by actors directly involved in the problem to be solved." While participatory design can be used as a technique within a standard UCD process, social media technologies are allowing it to play a more transformative role. This has come to light through conversations with sustainable design expert and former frog Jen Van Der Meer as well as the working practices of Jan Chipchase, the well-known design researcher for Nokia, and Melanie Edwards, the founder of Mobile Metrix. 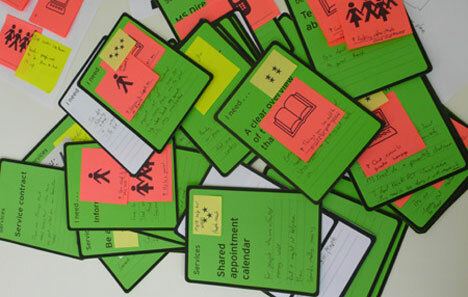 All three play active roles (albeit different ones) in engaging communities to motivate and change their own behavior using participatory design methods. 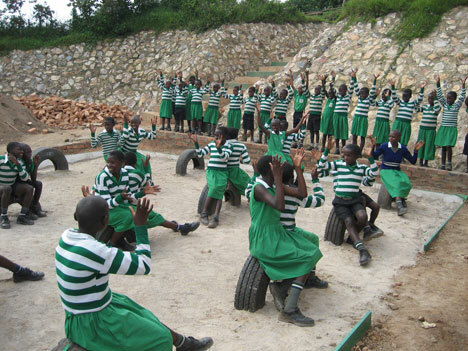 They have become catalysts for greater change. Jan and his team conduct ethnographic research throughout the world focusing on emerging behavior related to mobile technologies, and they've pioneered several research techniques. In an ongoing project called the Open Studios initiative, Jan and his team flip this traditional ethnographic research model on its head. Instead of recruiting users anonymously in a given community, the team working on Open Studios takes participatory design out into the open--to the commons--as an active form of community engagement. Jan uses posters, events, and prizes to attract as large a cross section of the community as he can. In the process he creates a network of influence, and the result is a type of social cohesion that builds community consensus around the idea of exploring new possibilities and embracing new futures. Yes, one of the objectives of these activities is to inform the design of Nokia's products and services. But that may take years to be realized. In the meantime, Jan achieves a more immediate and direct impact in the community through a change in mindset. He's creating fertile ground for new social practices to emerge--in this case around mobile technologies. Melanie Edwards has taken this idea a step further by recruiting a team of change "agents" that stay embedded within a community over time to identify needs, raise awareness, and measure the positive impacts on behavior. 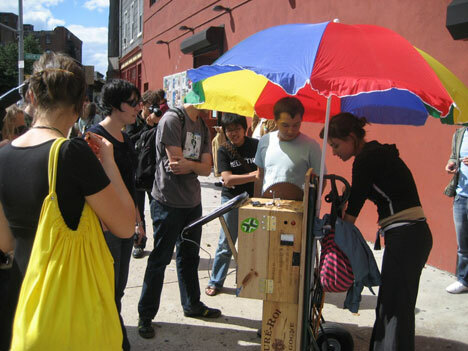 The temporary, guerrilla-design events that Jan creates for Nokia become internalized as an ongoing activity in the community. In turn, the community sees new possibilities to affect change and influence personal behavior and social practice on an ongoing basis. Most recently, she has applied her approach to fighting Dengue Fever in the Flavellas of Brazil with measurable results in the increased use of bug repellant. At frog, we saw first-hand how design can catalyze local change with Project Masiluleke, an effort to combat the high rate of HIV infections in South Africa through the use of mobile technologies. 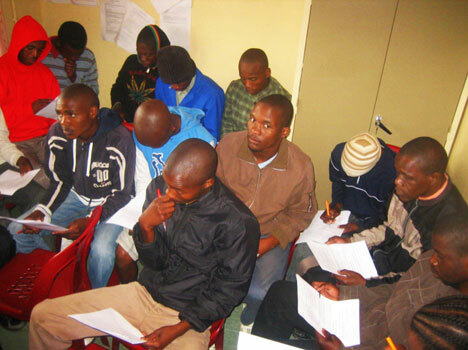 During the design process we recruited young men in different communities in South Africa to help shape a new solution to HIV self-testing, and by doing that we did more than "choreograph" a better testing experience. We were designing a system of participation. And as we've seen in past design research activities, participation breeds enthusiasm and influence--in this case an increased willingness to even consider the possibility of testing (particularly for men who have never tested despite infection rates approaching 40% in some regions). Also, in South Africa, where there is 90% mobile device penetration, ideas spread quickly when a small community of individuals are actively engaged. You can easily imagine this influence magnified through services like tweetluck, tweetsgiving, and foursquare--or Mixit in the case of rural South Africa. In this model, influence emerges directly from the design process itself and quickly spreads through social channels. New possibilities propagate within the community long before any new products and services can be brought to market. The influence of design extends beyond the notion of the catalyst. As new possibilities emerge within a community, they are given form by the designer. We now have so many tools for producing rapid, meaningful and remarkably believable proxies for commercial products and experiences, whether in hardware or software. These artifacts provide a different kind of social 'proof', something that many fine artists have taken note of as well. Designers can exert tremendous influence by what we choose to (and choose not to) make tangible. The influence these objects exert is not just a function of the discrete decisions that went into their design but, more importantly, their very tangibility--their physical undeniability. They assume a new reality by their physical presence. By making new sources of value tangible we transform alternative possibilities for social action into something credible, believable, sensible (in the sense-making sense) within the community. Community intervention with Mouna Andraos' cell phone charing station. Designers can exert tremendous influence by what we choose to (and choose not to) make tangible. Our tools are so sophisticated that the reality of these objects becomes quite persuasive, exerting an influence on the both perception and behavior. A great example of this can be seen in the work of Mouna Andraos, an interactive designer and artist who specializes in electronics. For one project, she designed and manufactured a portable cellphone recharging station that she pushes along city sidewalks like a 19th century street vendor. People gather around her cart to take turns charging their phones. In the meantime, they share cords and adapters while also exchanging stories. Through a direct design intervention Andraos encourages cooperation and discussion in a public setting and by doing so, she changes the social dynamics and introduces new possibilities in a particular location. Her design artifacts make new forms of cooperative behavior possible. John Thackara explains, we are "moving away from the idea that we have to make all of these decisions in advance, as designers or engineers. 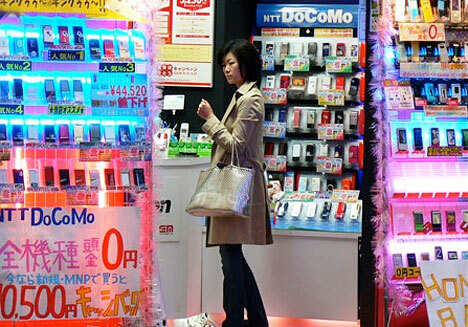 We need to enroll the creativity of our fellow citizens who used to be call consumers." In each of these examples the designer is stripping away some of our traditional detachment to engage as an active participant in shaping solutions within a social context. 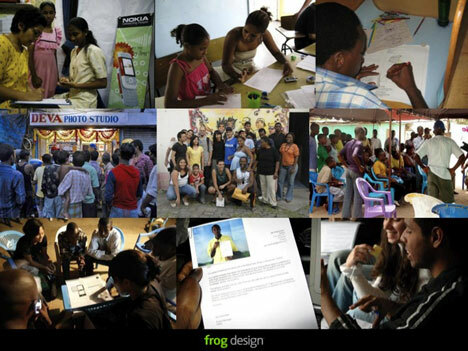 In one way our contributions are on equal level, joined with the ideas and activities of the community. We are contributors and not conductors. In the pit (in the orchestral sense) and not up on the podium, as John Thackara explains, we are "moving away from the idea that we have to make all of these decisions in advance, as designers or engineers. We need to enroll the creativity of our fellow citizens who used to be call consumers." This raises an equally important question: how do we sustain the effects of these new practices if our contributions are more personal and our role is less privileged? Can we do both: participate and elevate? One of the great strengths of the recent evolution of design practice has been the increased sophistication in our understanding of systems and platforms. My hope is that we can both embrace greater engagement and also broaden the impact of the ideas that emerge from these collaborations. As Ezio explains: "there is a difference between the transformation that happens normally and a designed system. Designed systems are stronger and more replicable. Designers transform an idea into practice." Concept cards for Live|Work's service innovation for people with Multiple Sclerosis for the UK's National Health Service. What does this mean for your practice? I often cringe these days when I hear designers gravitate towards 'platform' as solutions. All too often, this as an excuse to avoid direct engagement IMHO--and the tough choices that we are hired to make as designers. Platform strategies only become meaningful in practice, when combined with a participatory approach and long term engagement, often within a single industry or community. A great example of this is the health practice at Live|Work in the UK, another firm that has committed a portion of their efforts to the public good. They see platforms not as an excuse to remain at a distance, but a call to engage. A call that I hope more designers will answer--to great effect. Robert Fabricant is the Vice President of Creative for frog design where he leads frog's efforts to expand the impact of design into new markets and industries. An expert in design for social innovation, Robert is lead partner in Project Masiluleke, an initiative that harnesses the power of mobile technology to combat the world's worst HIV and AIDS epidemic in KwaZulu Natal, South Africa. Robert is an adjunct professor at NYU's Tisch School of the Arts where he teaches a foundation course in Interaction Design. In 2009, he joined the faculty of the School of Visual Arts in New York and is a faculty member of the Pop!Tech Social Innovation Fellowship Program. A regular speaker at conferences and events, Robert recently gave a keynote speech at the 2009 IxDA Interaction Conference. His work has been featured in a wide variety of publications, including I.D. Magazine, The Wall Street Journal, and Wired and he is a guest blogger for Fast Company. I'm sure I'm not the only one who feels the questions arising are made all the more pertinent by the global credit crisis and revision of free markets that is underway at the moment. Many threads from your poignant post have been unfurling for months if not years of course, to the point we have seen two camps emerging. One points to the inevitable rise of a more social value system of design and productivity, the other takes the neo-classical stance that fears any intrusion on personal freedom of choice. It's become a philosophical discussion in fact, overlapping with the justice and free market arguments put forward by people like Nobel Laureate Amartya Sen and Reith Lecturer Michael Sandel. Perhaps then a Philosophy of Design now needs to emerge, before we can go much further? Great piece with some very relevant ideas. I found the performance design section especially compelling as its something which we are experimenting with in our own practice here at Teague. Fast - relatively cheap - high fidelity is transforming design practice, yielding a process where active engagements with clients and users can harvest meaningful insights that are readily folded back into the design path. This is an important and timely discussion for all designers. Great post.